Have you got a cracked or dented bumper? If you have a cracked or dented bumper, never fear! SMART Paintworx can get this repaired for you in just a few hours & only a few hundred dollars. Our bumper repairs are affordable, convenient & give you that showroom finish you are wanting. 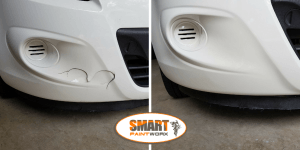 If you have a bumper dent, we can use a heat source to manipulate the dent out as much as possible, this will reduce the amount of plastic filler required before we prep the damaged area & paint, finishing with a clear coat. If you have a nasty crack through your bumper, we can have this looking like new in no time. We reinforce the back of the split or crack with a fibreglass e-poxy bandage & an e-poxy plastic repair sealant. The sealant is actually stronger than ABS plastic which the bumper is made of. The technician will then plastic weld the the area & use a plastic filler to cover over the effected area, prep & then spray. This will once again be undetectable upon completion. Our paintwork is guaranteed for two years. This should give you piece of mind that your vehicle is in good hands with our skilled technicians. 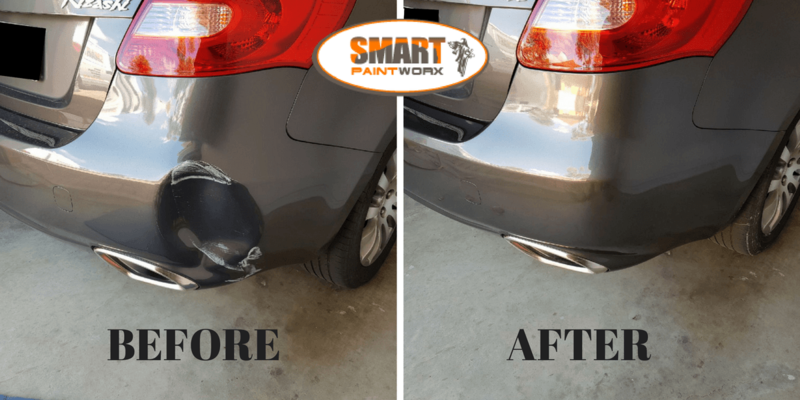 If you would like a quote for your bumper damage, all you need to do is send through your photos & information such as full name, suburb & make/ model of your vehicle. One of our friendly staff will be in touch with your quote & we can get you booked in as soon as possible. 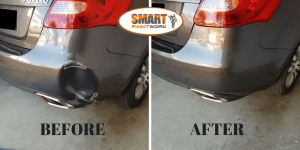 This entry was posted in Bumper Bar, bumper repairs adelaide, Cracked Or Dented Bumper and tagged Bumper Bar Damage, bumper bar repairs adelaide, Cracked or dented bumper. Bookmark the permalink.